Scanning the news headlines, the hits seem to just keep on coming on the jobs front. The nationwide unemployment rate increase to 9.2% from 9.1% over the month. The unemployment rate also increased in 28 out of 50 states in June. California, Florida and Nevada — the three states that were hit hard by the housing bubble — all had unemployment rates still well over 10%. The more disturbing numbers are coming from the long-term unemployment. Nationally, the average duration of jobless in America shot up to 39.9 weeks as of June, or about 10 months, which is a record high since the BLS started tracking the data in 1948. A year after the official end of the recession, the percentage of the long term unemployed (out of work for 27 weeks or more) now stood at 44.4% (or 6.3 million people) of the total jobless, up from the 43.1% level last June. Those out of work for a year or longer jumped to around 4.4 million, or 30.3% of all unemployed. Moreover, more than two million (2,039,000) Americans (over 14% of the unemployed, up from 9% in 2010) have been out of work for 99 weeks or longer. Huffington Post reported that this is the first time since the 99 week statistic has been tracked by the BLS that it has exceeded the two million mark. 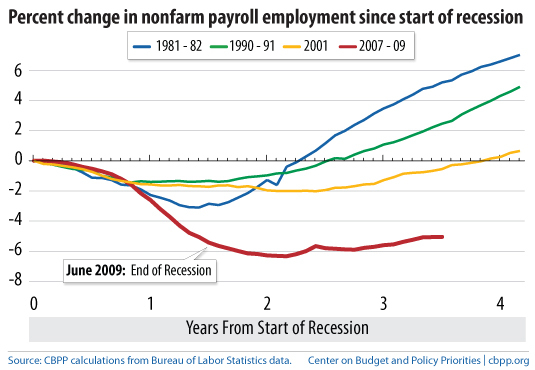 A recent BLS study noted that the chance that a person who had been unemployed for less than 5 weeks would become employed within a month was about 30% in 2010. 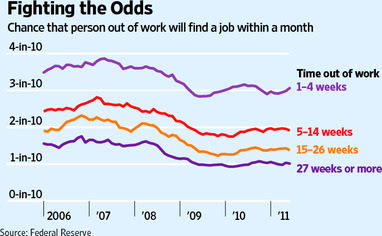 For those unemployed 27 weeks or more, that probability dropped drastically to only 10%. 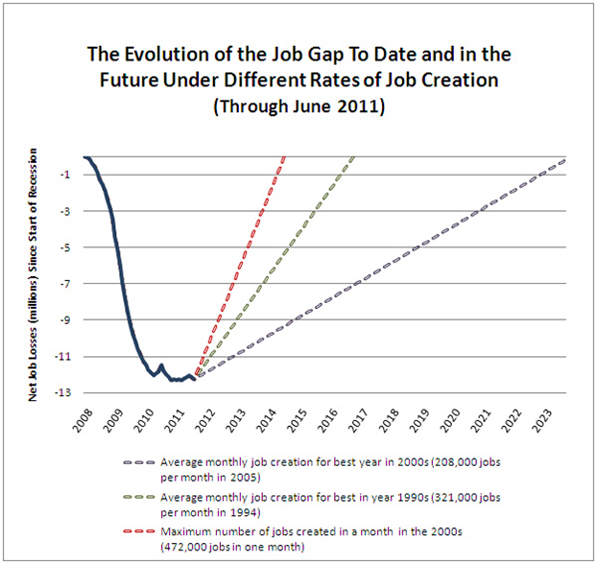 Furthermore, 11% of the job seekers took a year or more to land another job in 2010, a huge leap from 3% in 2007. The elevated long-term unemployment could be partly attributed to the fact that there are 4.7 unemployed workers in May for every job available, i.e. 13.9 million jobless competing for 3.0 million job openings. The ratio was the same as in April and has never risen above 4-to-1 for nearly 2.5 years, whereas in the 2001 recession, the ratio never exceeded 2.8-to-1, according to the Economic Policy Institute. How Many New Jobs Does the U.S. Need? Based on that job gap estimate and historical trend in previous recession-to-recovery cycles, assuming 208,000 new jobs per month (best average rate in the 2000’s), it will take 12 years or until October 2023 to close the job gap. A separate estimate done by McKinsey says in a high-growth scenario, 21 million total new jobs or 187,000 jobs per month are needed for U.S. unemployment rate to fall to 5% by 2020. Over the next year, if the labor participation rate remains at 64.1% (which is at almost 27-year low), then 95,000 new jobs per month will be needed just to keep the unemployment rate constant, based on the estimate by Calculated Risk. However, the economy has fallen far short of even these conservative estimates. 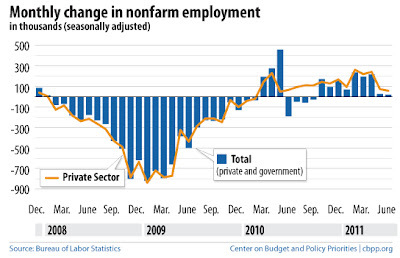 In the first half of 2011, US employers added an average of 126,100 jobs per month, well below the rate of past recessionary cycles, while the month-on-month trend is going downwards with only 18,000 new jobs added in June, followed by 25,000 created in May. With the current pace of job creations, the long-term unemployment is likely to remain elevated thus becoming a self-fulfilling perpetuating cycle, since the longer a worker is out of job, the skills and knowledge start to deteriorate and eventually become obsolete. Some call the long-term unemployment the newest form of workforce discrimination as employers tend to favor job candidates already have a job. So, the reality is that the likelihood of those out of a job for a long period of time becoming employable again tends to diminish over time when competing with plenty of other candidates albeit not as experienced, but with more up-to-date skills, and on a lower pay scale. Higher government expenses if jobless workers turn to Social Security disability or other welfare programs to supplement income. Some economists have argued the existing benefit system is too generous and makes Americans too dependent on social services. However, considering the loss of self-esteem and the stress involved, it seems unlikely that there are that many working people who would purposely stay jobless just to stretch out the unemployment benefit. Also it is reasonable that some Middle Americans, after years of paying a third of every penny earned into the social security, and other related programs, are counting on the safety net to bridge the income gap during the harder times such as losing a job or retirement. 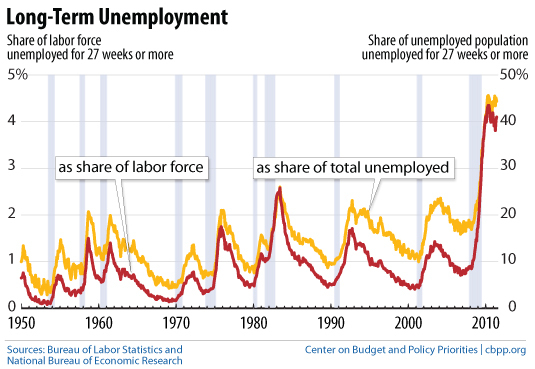 The current unemployment situation is a structural rather than a cyclical issue, which means no amount of Fed’s QE could make much of a difference. It will take a concentrated effort from the policy makers to ensure clear and business-friendly regulations, investment incentives and education programs to keep the nation’s workforce internationally competitive, while reducing the potential imbalance of the skill gap. Meanwhile, 'shortcuts' into the jobless and senior benefit programs will not address the root cause that has got the nation to the current state of debt and deficit in the first place.